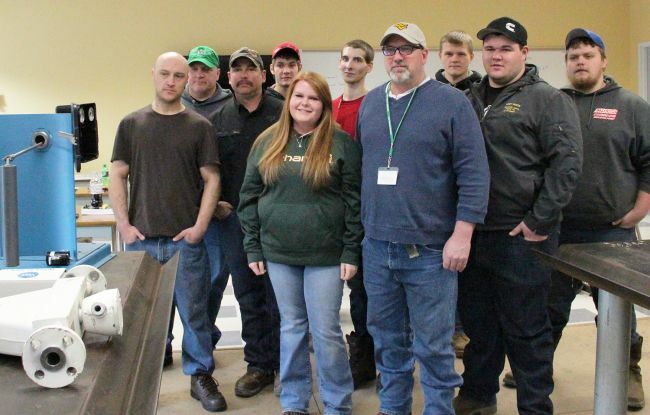 A Texas-based natural gas contract compression and solutions provider has provided valuable in-class assistance to students in the Petroleum Technology program at West Virginia Northern Community College. According to Curt Hippensteel, petroleum technology instructional specialist, Denny Russell from Pegasus Optimization Managers, LLC, earlier this month interacted with Northern students in their Production Operations class lab. The lab is located in the Applied Technology Center building at 16th and Market streets on the downtown Wheeling campus. Hippensteel explained that Pegasus provided Northern with lab equipment, including a Norriseal Wellmark Throttle Pilot Assembly, Norriseal Wellmark Snap Pilot Assembly, three Wellmark High Pressure Gas Regulators, several regulator rebuild kits, two Rigid tubing benders and a Rigid tubing cutter. “This donation was designed to support our students by enabling them to change pilot assemblies in level controllers and rebuild gas regulators, both of which are important skills for field technicians in the petroleum industry,” Hippensteel said.